It’s a midweek roundup of books with commas in their titles. Okay, these two books are also about countries in the midst of crisis. Black Dove, White Raven is set in the years leading up to Italy’s invasion of Ethiopia in 1935. 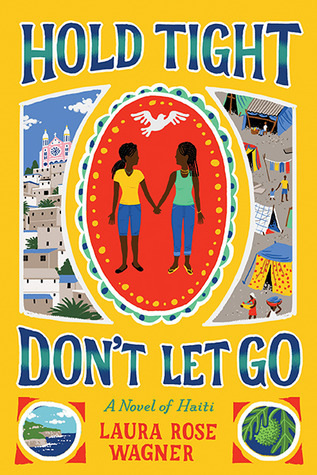 Hold Tight, Don’t Let Go presents more recent history—the immediate aftermath of the earthquake that devastated Haiti in 2010. If you’re a regular reader of this blog, you may remember that in 2012 Karyn made a passionate case for Code Name Verity (a book that will still make her start to well up if we talk about it for too long). 2013 brought the release of Rose Under Fire, which Sarah thought was a stronger book overall but lacking the showmanship of Verity. 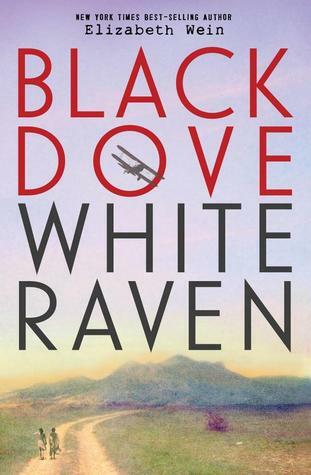 Of course, now we have Black Dove, White Raven, Wein’s latest novel in what she has dubbed her Young Pilots Series. I’m sure you see where I’m going with this: basically, it was my turn to review a Wein title. That’s not to say that I had no interest in the book; I was actually neutral about it. I admire Verity, but I couldn’t connect to it emotionally and I had even less success with Rose. Still, I approached Black Dove, White Raven with an open mind. As with Verity and Rose, Black Dove, White Raven uses a variety of formats to tell the story. The novel is written in personal school essays (“themes”) from two different characters’ perspectives, flight logs, and it’s interspersed with short stories written by the narrators, Teo and Em. Their voices work but Wein also spends about 100 pages establishing the characters and setting the scene. It’s laborious and by this point, I’d prefer to read a nonfiction account of the Italian invasion of Ethiopia. I recognize that this says more about me as a reader than the book itself so I really want to know why others think this is a praise-worthy, literary work. It is certainly a well-researched novel; Elizabeth Wein’s notes in the backmatter are a fascinating look into her process and her attention to detail. If the use of language were more interesting, or the characters more engaging, perhaps I could have been more invested in the themes. Laura Rose Wagner’s debut novel is also told from the first-person perspective of a teenager facing the unimaginable. Magdalie has a straightforward yet lyrical way of describing her life: “I keep thinking I can hold time still if I just concentrate on it.” Separated from her sister Nadine, who gets a visa to move to the U.S., she has to deal with the post-earthquake world on her own without her biggest support. The situation is moving and Wagner does a nice job evoking the physical and cultural setting, but the style is journalistic so as with Black Dove, White Raven, I never made an emotional connection with the book. Part of this may have been due to the use of Haitian Creole. The dialogue will often have a character say something in Creole, but either follow or precede that with the phrase in English; it’s a clumsy technique. Providing the translation of non-English languages within the text of a narrative in English is great when it can be incorporated seamlessly but that’s not the case here. Adding to the strangeness is the inclusion of a glossary at the back of the book to provide definitions for words and phrases used throughout. It’s certainly interesting and educational, but why have it there if the goal is to have readers’ comprehension come from the text itself? I’m not convinced that either of these titles will have a chance with the RealCommittee, although each has some compelling critical praise. Dear readers, please forgive that I’ve offered incredibly biased opinions and convince me that these two novels with big ambitions have the literary chops to go the distance this year. I liked Black Dove White Raven but my colleagues didn’t , so we did not include it on our Mock Printz list this year. I was mostly captivated by the historical aspect and now that I read your review, I would just as well have read a nonfiction book about the Italio-Ethipoian conflict. It was so tragic and barbaric. Sheinkin, Hoose, Murphy, Bartoletti, MT Anderson—if you are reading this, here is your next assignment: We need a good narrative nonfiction written on the Italio-Ethipoian conflict, please! Black Dove, White Raven is one of the handful of books I read this year where I said to myself, “this book could go far this awards season.” Admittedly I am a big fan of Wein’s young pilot books so perhaps that was inevitable. I was very interested by the historical setting (which I knew nothing about) and I thought the format choices and interplay between narrators was handled extremely well and shows Wein’s writing at the peak of her game. While this is a slow story I think it works well to get readers to buy into the story. I thought the contrast between Em/Teo compared to Black Dove and White Raven were also interesting to show how they both grow into certain personas to adapt and thrive in the face of some surprising obstacles. The more I think about this book, actually, the more I realize what drew me in at every level were the characters and the way this book deals with them as they negotiate their world.